We are a leading Manufacturer of marking ink from Vadodara, India. Coding Marking Ink for all applications of batch printing and stamping. Our coding inks and machines are very useful machines to all food and pharmaceutical & other packaging industries to print batch no. . , mfg. Date. , exp. Date. , retail price etc. . On their labels, cartons, polypack bags, pouches, tin bottoms, cotton bags etc. Variety of hand operated and semi automatic batch printing/coding machines are working on the same principal of tradle machine conventionally used by all the printers. In both the machines the matter is to be composed in type block with type letters. Ink to be fed on the aluminum roller. On each stroke of the machine the composed type letters are inked by moving rubber roller. Also the semi automatic batch printing/coding machine is electrically operated and foot switch is provided to 'on' or 'off' the machines as both the hands of the operator remain free in convenience of feeding and discharging the labels/cartons/bags. Also pic has the hand operated batch printing/coding machine in addition of feeding and discharging the labels/cartons/bags by hand, the stroke of the machine is also operated by hand. 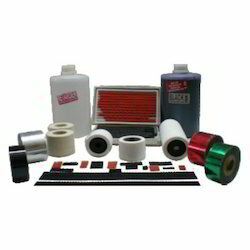 PIC have developed special Marking Ink and stamping ink which is also known as batch-printing ink and antifreeze coding ink for low temperature applications. This ink is very useful wherever coding is to be done on ice-cream / butter / milk / ghee & other packing which are to be stored in deep-freezers. This ink is free flowing, lipid, transparent, water-resistant and can be used to mark on glazed / non glazed, metallic / non-metallic surfaces. 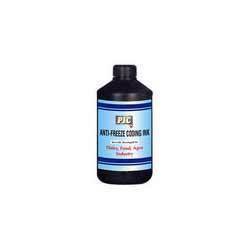 This ink is resistant to temperature as low as -20 C. PIC-Antifreeze coding ink like batch coding ink and industrial coding ink are of food-grade quality, quick-drying and has excellent resistance to lubricants / oils / ghee / beverages & spermicidals. The marking on the surface is clear, sharp and indelible. It is suitable for various coding applications like dairy, food, pharma, beverage on automized and manual packing lines. This ink is being supplied to over 950 clients all over India and exported overseas as well. Looking for Bottle Marking Ink ?